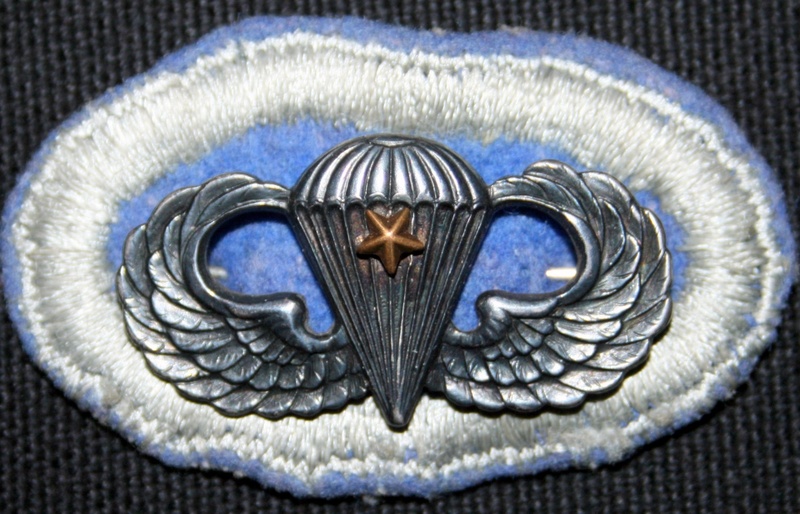 The first Parachute badge was designed during World War II by Captain (later Lieutenant General) William P. Yarborough of the 501st Parachute Battalion. 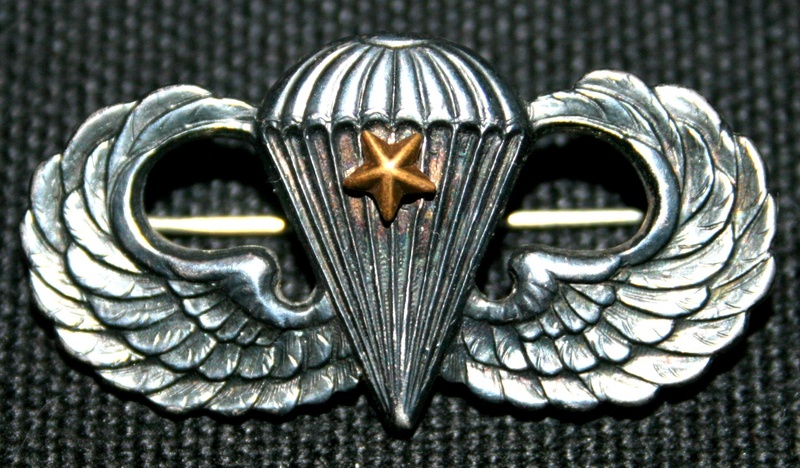 A memorandum of record written by Captain Yarborough on April 22, 1941, tells the story of the birth of the parachute badge. "On March 3, 1941, I was ordered to Washington to report to the Adjutant General for temporary duty in the Office of the Chief of Infantry. 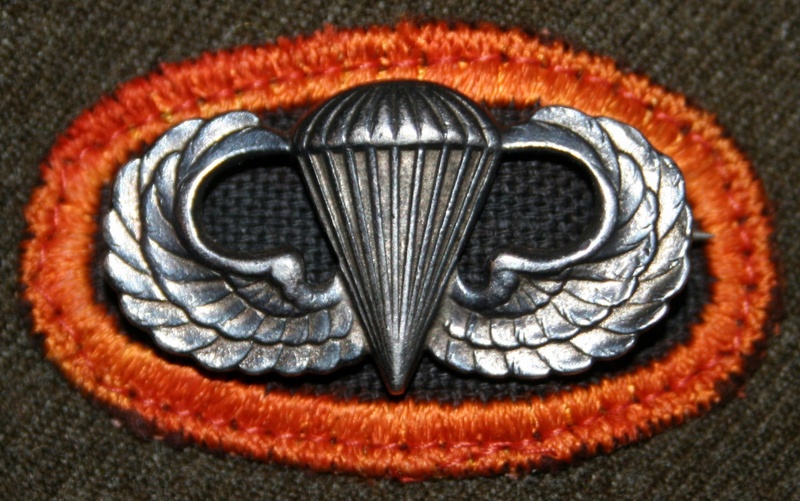 My mission was the procurement of a suitable parachutist badge with would meet with the approval both of the War Department and the Commanding Officer of the 501st Parachute Battalion. Major Miley (commander of the 501st), before my departure, gave me full authority to approve any design that I considered acceptable, and to do so in his name. The same authority was delegated to me in the name of the Chief of Infantry. "I drew the original sketch in the office of Lieutenant Colonel Beuchner, G-3; a finished copy of my original sketch was prepared in the office of the Quartermaster General. Through the help of Mr. A.E. Dubois, in the Quartermaster General's office, 350 of the badges were procured from the Bailey, Banks & Biddle Company in Philadelphia and were in the hands of the Commanding Officer of the 501st Parachute Battalion by March 14, 1941. This is believed to have been an all time speed record for War Department Procurement." "I personally took the correspondence relative to the badge's approval from one office to another until the transaction was complete. This operation took me one entire week, eight hours a day." 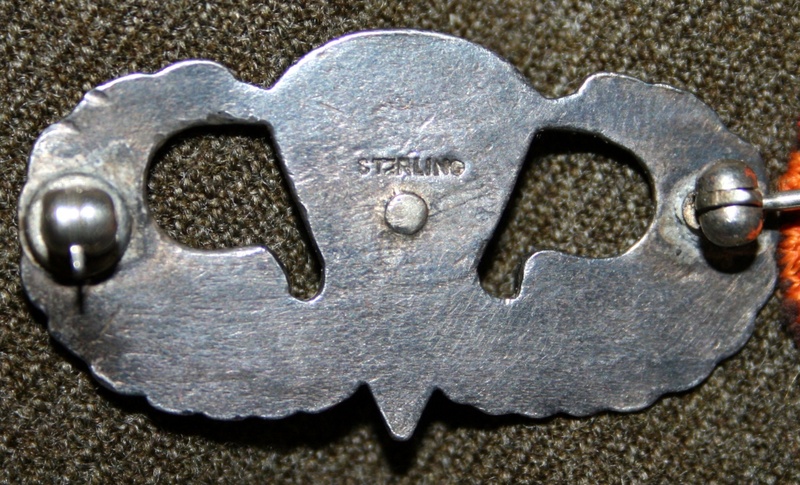 Captain Yarborough even applied for a patent to protect the design from unauthorized reproduction. 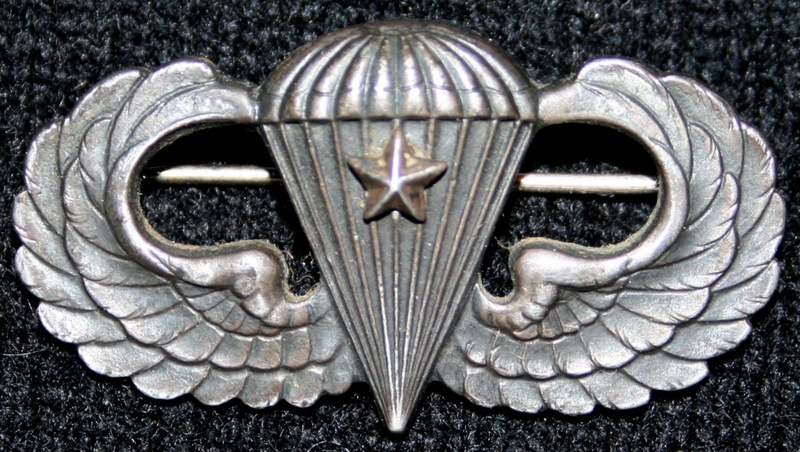 On February 2, 1943, Patent #134963 was granted for "A Parachutist's Badge" for a period of three and one-half years. 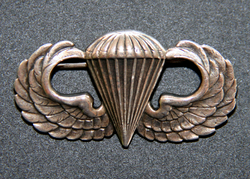 The Parachutist Badge was formally approved on 10 March 1941. It is usually called "Wings". Nice example of Parachute badge. 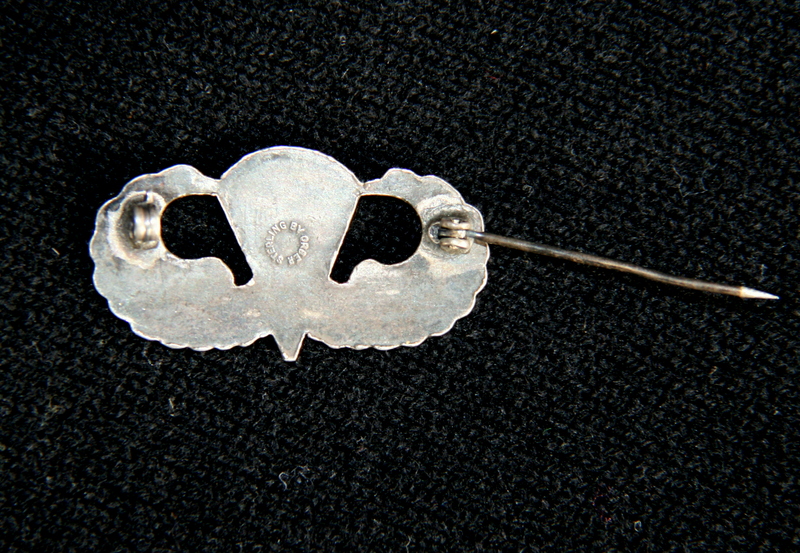 It was found in the 90's in Athus (south Belgium) in a flee market. It was lost in an old buttons box. 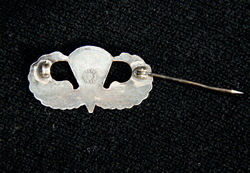 In cleaning it I have found it is engraved on the reverse side "souvenir de Raymond Kelly". 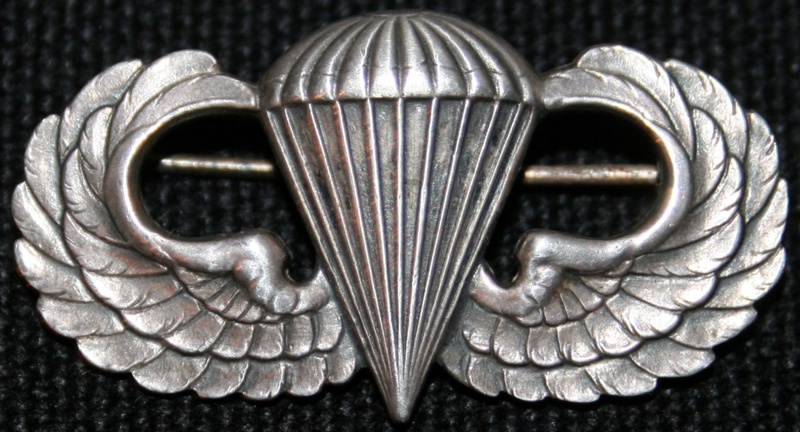 The only one I have found was member of the 139th Airborne Engineer Battalion (TFH collection). 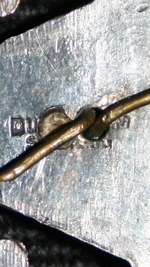 You'll find below examplar of 17th Aiborne trooper's Parachute Badge with or without oval. 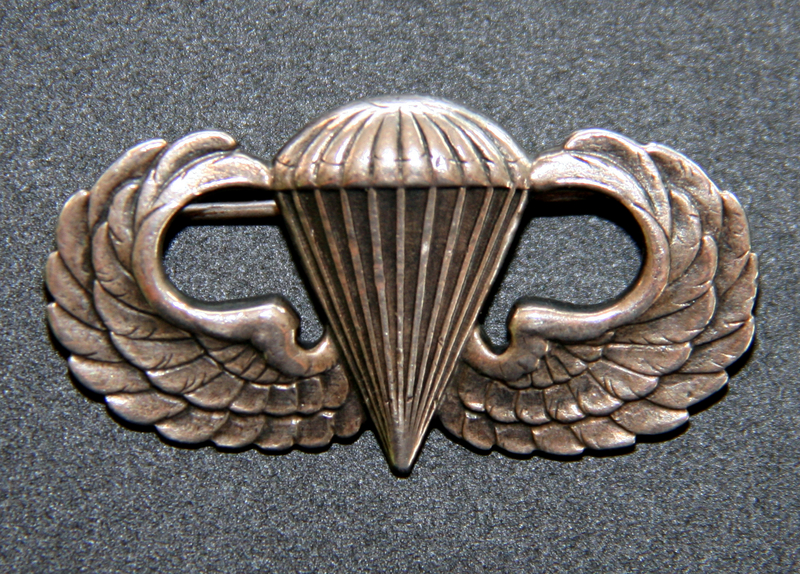 This nice Parachute Badge with oval belonged to an unknown soldier of the 517th PIR (laundry B-4022) who served with the Regiment from its activation in 1943 to the end of the war in 1945. 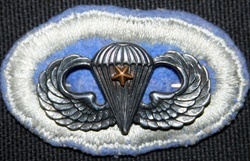 The badge is a DUROCHARM production and includes a battle star for one combat jump (in this case for the operation Anvill - Dragoon in August 15, 1944) (TFH collection). 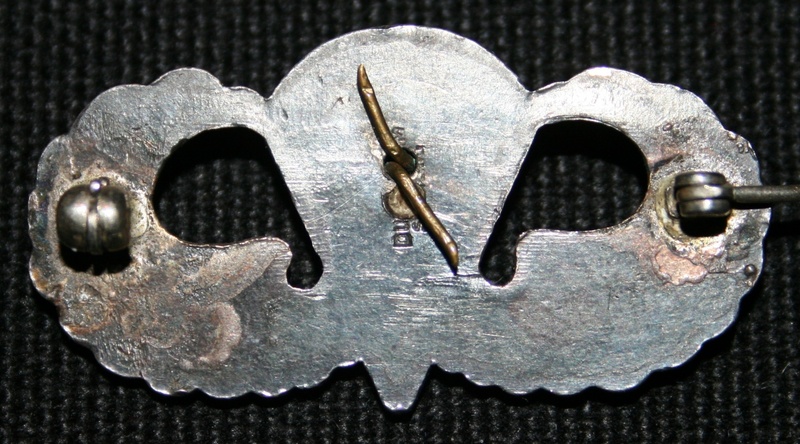 This exemplar belonged to John K Turner (ASN 18208946) who served with the 513th PIR. 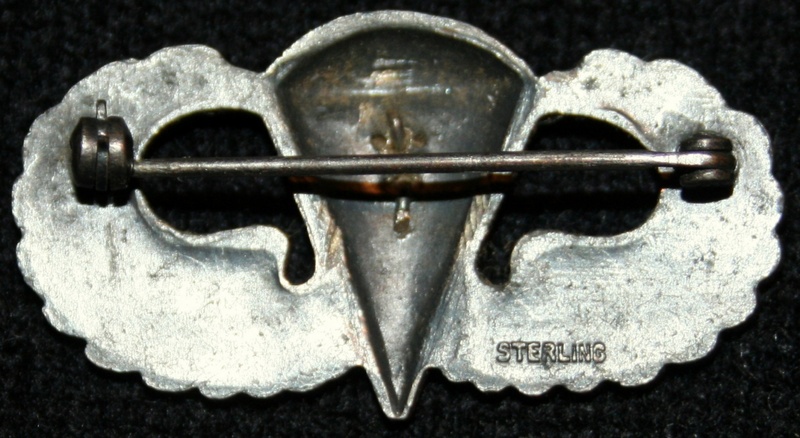 Insignia includes a steel battle star for one combat jump (in this case for the operation Varsity in March 24, 1945). The only inscription on the reverse side is Sterling (TFH collection). 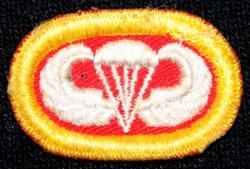 This Parachute Badge with oval is still sewn on the Ike jacket of Bois Grime (ASN 38664799) who served with Cie B - 507th PIR. 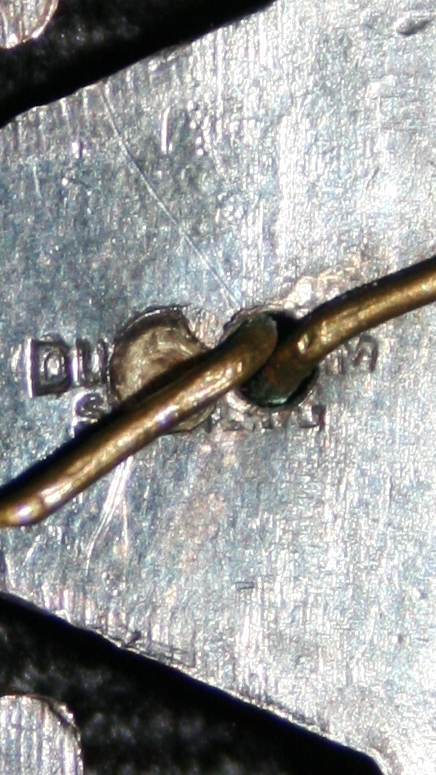 You can see the oval insignia in the "Oval Background trimmings" chapter (TFH collection). This unusual woven Parachute Badge on red and yellow oval belonged to Edgar L Adams (ASN 15303214) who served with the 464th PFAB (TFH collection). 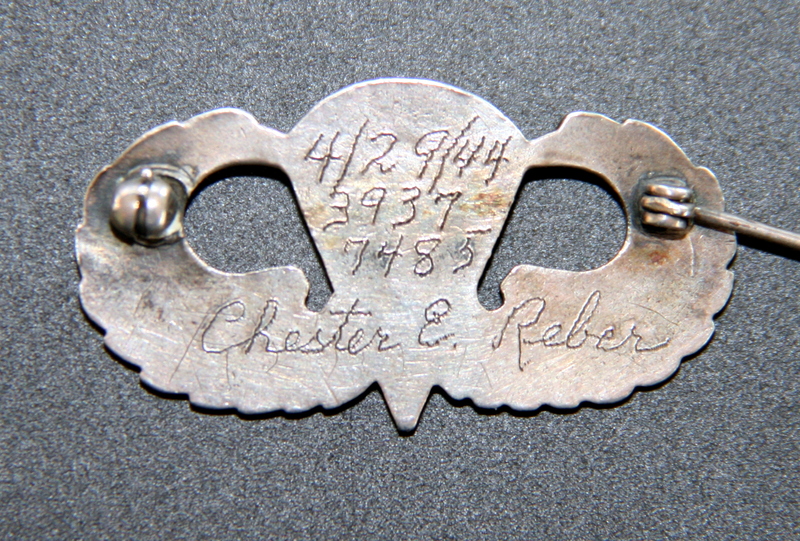 This Parachute Badge belonged to Wendell F ANDERSON (ASN 37176818) who served with Cie HQII - 507th PIR. It is an ORBES production (TFH collection). 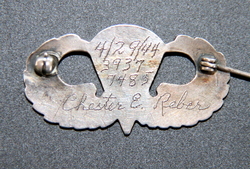 This Parachute Badge belonged to Chester E REBER (ASN 39377485) who served with Battery HQ - 680th GFAB. 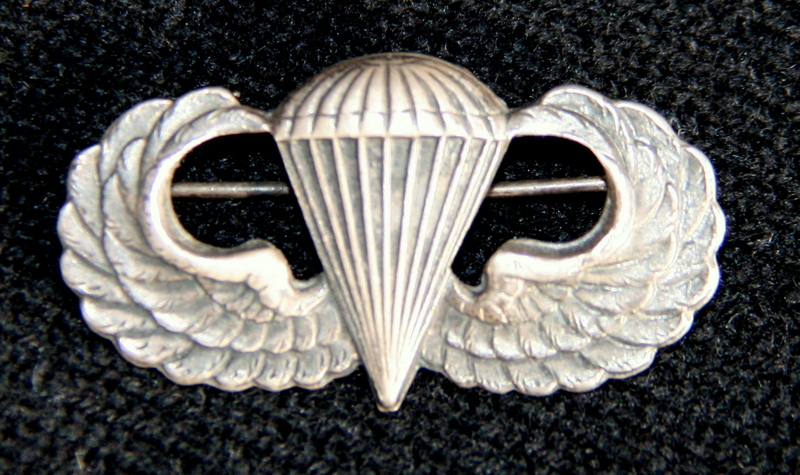 This unmarked exemplar has been engraved by the paratrooper, probably to commemorate his paratrooper qualification (TFH collection).